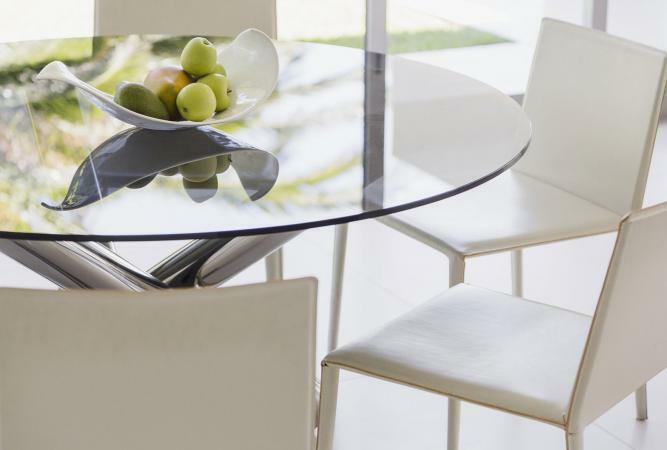 Glass tabletops often need replacing due to age, scratches and even breakage. You can find a variety of replacement glass tops in several sizes and shapes. Tempered glass will shatter into harmless small pieces should it be broken. This safety factor makes tempered glass the only choice for all glass tabletops. Some patio tabletops feature a hole in the center to accommodate an umbrella. A few companies offer customized table dimensions that can feature an umbrella hole or a smooth tabletop. You can also find standard sized tabletops with or without umbrella holes. You may prefer a frosted or textured look over clear glass. This is purely a personal style choice. A clear glass tabletop can make a patio space appear larger. A frosted or textured glass gives a more solid table illusion. A small patio can be compensated with a clear glass tabletop. Some table frames are designed for a glass tabletop inset instead of an overlay tabletop. You can save money with a rough edging finishing for this frame design. 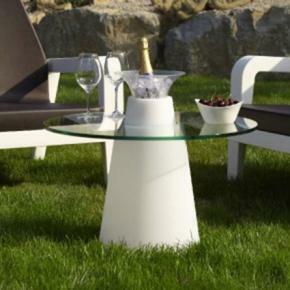 Fab Glass and Mirror offers three types of glass tabletop replacements for patio tables. Weights go up to 93 pounds (shipping weight). Round clear 1/4" thick glass tabletops from 42" to 60" diameters are available and feature a 2" center hole. Round 3/16" thick Aquatex glass tabletops from 41.5" to 54" diameters with a flat polish are available with a 2 1/4" center hole. Rectangle Aquatex 38" X 60" glass top either 1/8" or 3/16" thick with a flat edge features a 4" center hole. Shipping is free and prices range from about $180 to $320.Website customer reviews show they are very pleased with quality, service, and price. Dulles Glass & Mirror offers custom-cut glass tabletops in several shapes and sizes. 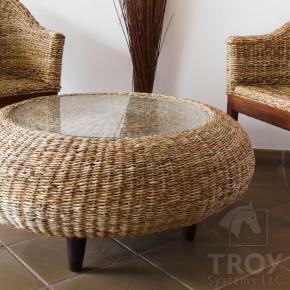 Each table is custom-made according to your specifications, including the size needed for the center hole. All custom orders are final with no returns, except when receiving a damaged tabletop. Shipping is a flat $2.99 rate, although pricing is custom (check their website for more details). Website customer reviews show that people are pleased with their purchases and cite quality, service and price as being top notch. Pier 1 offers indoor/outdoor tempered clear glass tabletops in either round or rectangle shapes with a 2" center umbrella hole. Shipping: Free shipping order over $49 or free store pickup; white glove in-home delivery is also available for $169. Whether you're looking for a round, square or rectangle coffee glass tabletop replacement, you can find a variety of sizes and finishes to fit. Beveled: This finish is a straight edged slope that can be from 1/2" to 1.5" in width. Flat: This is a squared edge that is also polished so it has a smooth feel. Pencil polished: This edging resembles a pencil length cut in half and gives a round edge. Seamed: This finish features sanded edges that smooth out the sharp corners but is often used for inset frames. This 36" diameter round 1/4" thick glass tabletop with a flat edge is one of Amazon's Prime products. It's sold through Troy Systems and has positive customer reviews posted. Replacement Glass offers customized glass top replacements, including glass tops for coffee tables. Type: Choose from tempered, annealed, ceramic fireplace or mirror glass. Shape: Rectangle or square are the two shapes offered. You will select the glass thickness, width, and height. Shipping: Calculated at time of order. Price: Calculated once selections are made for type and shape. You can decide that a beveled glass tabletop is the perfect replacement for an end table or nightstand. Bevel edging will give an elegant look, but might not be ideal for setting drinking glasses or other objects onto an end table or nightstand since the bevel is a downward slant. Flat edging is usually the ideal choice. To avoid sharp corners, you can always opt for round corners. Some tabletops for smaller tables are offered in solid colors, such as a blue or green. This can add a fun design option to a den, study, or bedroom. The only drawback might be if you change your color scheme. You can find several replacement glass tabletops for occasional tables, such as end tables and nightstands on the Houzz website. Free shipping is available through Houzz. Select a 12" round tempered with either a 1/2" or 3/8" thick glass top. Available in 1" beveled or flat polished edge. Price: around $50. Purchase a 24" x 48" rectangle that's 1/2" thick with 1" beveled edge featuring 1" radius corners. Price: around $135. Get free shipping through Walmart. Some glass top dining tables are large and you should be prepared to pay more for a table that seats eight than one that seats four. A large glass table diverts attention from the table to the chairs, flooring or rug, and other furnishings. A glass tabletop provides a floating effect and reflective surface for your tablescape of a centerpiece and place settings. You may have the option to select annealed glass. Knowing the difference between the two can help you make an informed decision. Tempered glass: This glass tabletop is an excellent safety choice since it will shatter into small pieces should the glass be broken. Tempered glass is four to five times stronger than annealed glass. Annealed glass: This is a plate glass and is often used for large tabletops. The consideration here is exposure to direct sunlight can possibly weaken the glass, depending on the heat intensity. This glass doesn't shatter when broken; it breaks in large pieces often jagged. This glass poses more of a safety risk. When purchasing a large tabletop, ask if it is tempered or annealed glass and then make your purchasing decision. When searching for a 30"square glass tabletop to seat two in a kitchen nook or apartment, Pier 1 has a very economical solution. Clear glass: This glass replacement is 3/8' thick with beveled edges. Shipping: Opt for free shipping with in-store pickup. White Glove delivery is available for extra fee. Custom cut glass tabletops is one of the best ways to ensure you have the exact replacement you need. ADM Glass makes the process easy with several options you select to ensure you have the right dining room glass top. 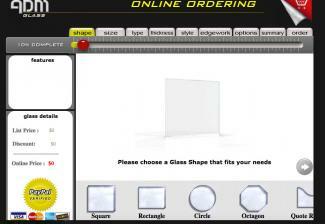 Shape: Choose from square, rectangle, circle, octagon or customized shape. Size: Choose the width and height all the way to 1/16" for true customized sizing. Thickness: Choose from 1/8" to 1/2"
Shipping pricing is given at time of placing order. Pricing for the tabletop is custom based on your selections. Many of the replacement glass tabletop companies offer a wide range of tabletops to fit occasional tables and dining tables as well as coffee tables, end tables, and patio tables. Glass top dining tables and occasional tables often feature glass, wood, metal, ceramic or marble bases. Depending on the base design, you may need a specific shape or you may decide to go with a different option. Customized glass tabletop companies can offer you many unique choices that will give your table a one-of-a-kind appeal. Gray or bronze colored glass can lend a greater design option to your decor. Founded in 1952, Glass Tops Direct offers a wide range of tempered glass tabletop choices when it comes to find a replacement for your glass tabletop. The type of table can vary from something as small as an occasional table that's only 10" in diameter to a 72" dining table. You can find whatever size needed and in a variety of finishes as well as glass table protectors. If you are unable to find the size and shape you need, the company offers a customized service. Free bumpons are included with every order to be placed between the glass top and table base. Round clear finish: The round tabletops come in 1/4", 3/8", 1/2" and 3/4" thickness. Edge style available include, 1" bevel, flat polish, ogee, pencil polish and wave edge. Sizes available include, 10" to 72" diameters. Weight varies from 8 pounds to 300 pounds, depending on size. Round gray or bronze finish: Bright flat polished edge features 1/2" thick glass and it's available in 18" to 60" diameters. The 18" retail is about $130 and the 60" runs about $990. Square: These tabletops are 1/2" thick with 1" beveled edges and touch corners. Touch corners are sanded so they aren't sharp and dangerous. Size range is 10" to 60". It weighs between 8 pounds and 140 pounds, depending on size. Depending on size, you'll spend about $79 to $760. Racetrack oval: Tabletops are 1/2" thick are available in sizes 24" x 48" to 44" x 84" and have 1" beveled edges. Weighs from 60 pounds to 200 pounds. Expect to pay anywhere from about $469 to $959. Boat shaped: Only one size is offered for this fun design. The tabletop is 42" x 72" and 1/2" thick with beveled edges. It weighs 150 pounds. Retail pricing is set at just over $600. E-oval: This 1/2" thick, 1" bevel-edged glass tabletop measures 42" x 72" and weighs 150 pounds. You'll pay about $630. All orders ship free. Smaller sized tabletops are shipped via FedEx Ground. Larger sizes are shipped via Common Carrier with curbside delivery. In-home White Glove delivery is available in many states for a $44 fee. Shipments to Canada have several tax and customs fees, depending on the amount spent. Common Carrier fees include a 6% sales tax. Other fees include a local province tax and custom tax (approximately $75). Overall, Glass Tops Direct customers are happy with their purchases and praise the speed and service for their orders. The best way to ensure you purchase the ideal replacement for your glass tabletop is to measure the size needed. If opting for a customized glass tabletop, be sure you fully understand any guarantees and triple check your order before placing it.